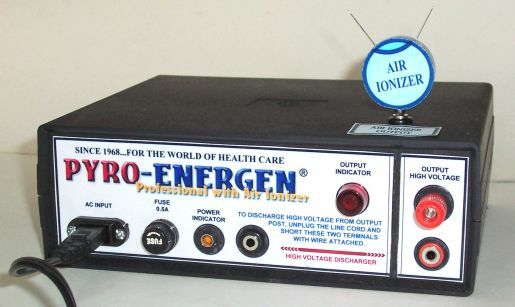 Air ionizing appliances can improve the health of human beings. It purifies air by generating negative ions. Negative ions occur naturally near waterfalls and after heavy thunderstorms and have the effect of cleaning the air. The negative ions are attracted to positively charged dust and smoke particles. These new heavier combined particles then fall out of the air leaving purified air. Air ionizers are nothing new. Ionizing devices are getting popular everyday. In Japan, some manufacturers of air-conditioner are adapting built-in ionizers on them to give clean cool air and to make you feel fresh in your room. Even everything from toothbrushes to fridges and washing machines have negative ion generators in them. 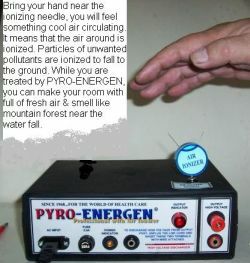 As a matter of fact, our first PYRO-ENERGEN model was made with negative ion generator built-in. However, forty years ago, ionizers were not known among our clients. 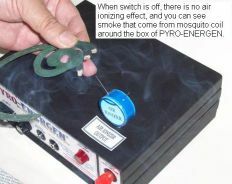 We stopped producing PYRO-ENERGEN with built-in ionizer because of its bulkiness, production cost and nonpopularity. Today, electronic technologies are so advanced that circuits are getting smaller like IC chips, reducing the cost dramatically. 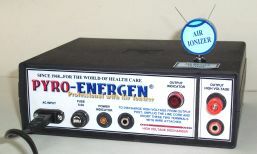 We thought of adapting air ionizer circuitry with PYRO-ENERGEN, again, as many are demanding to produce PYRO-ENERGEN with built-in negative ion generator. Why negative ions are essential to living things? Ions are natural particles in the air that have either a positive or negative charge. They get this charge by either losing or gaining an electron. Negative ions are the good ones. They attach themselves to airborne particles such as dust, pollen, smoke and dander, causing them to drop from the air. Nature provides both positive and negative ions in abundance, but when it comes to feeling good, it's the negative ions that are important. The best natural generator for negative ions is lightning, followed by ocean surf and waterfalls. Negative ions are also abundant in mountains and forests, since all plants give off some ions. In clean, natural air, you'll find very high concentrations of negative ions. 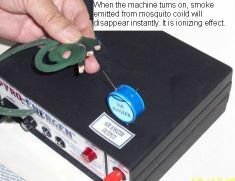 Negative Ions can be actively produced by high-voltage electricity run through metal needles (needlepoint ionization). Needlepoint ionization is by far the most effective way to produce high volume negative ions. However, negative ions have a very short life (2 - 6 minutes) and die before they can circulate completely throughout a dwelling. Also, some high-powered ion generator will produce what has been termed "black wall", a black dust that settles on surfaces, in particular around the ion generator. The Surround Ionizers have overcome the black wall problems, but negative ionizers do have other limiting factors. An oxidation technology that uses germicidal ultraviolet light produces enough negative ions to be beneficial in removing airborne particulates in a surrounding area and in helping change the ion balance in that environment, but without creating black wall. Negative ions purify the air by magnetically attracting to pollutants until these newly formed larger particles become too heavy to remain in the air you breathe. These fallen particles are typically collected by your normal cleaning activities. However, when cleaning these fallen particles, it is recommended that you use a slightly wet towel or mop to wipe the walls and floors BEFORE using a vacuum cleaner. In this way, you can avoid growing molds and its smell in the room, which may cause sicknesses. The most important thing, though, is that they are taken out of the air, preventing you from inhaling them into your lungs, which can cause sicknesses such as allergies and asthma.